By Teresa L. Finnila, M.D., Paul M. Sherman, M.D. An adolescent presents with high fever, sore throat, odynophagia, possibly with neck swelling. A tonsillar infection is suspected, but how severe? In the ED setting, contrast-enhanced CT plays a key role in distinguishing between acute tonsillitis, and tonsillar / peritonsillar abscess, which have divergent treatments. Acute tonsillitis will appear as edematous inflamed lymphoid tissue, without a focal fluid collection. In some cases, a distinctive “tiger stripe” appearance is present, as seen in the right palatine tonsil in this image (Fig.). Treatment with oral antibiotics is appropriate, targeting the most common pathogens: Group A ß-hemolytic Streptococcus, Staphylococcus aureus, and Haemophilus influenzae. However, tonsillar / peritonsillar abscess presents as a hypo-attenuating fluid collection with peripheral rim enhancement, as seen above in the left palatine tonsil (Fig. ), requiring surgical incision and drainage. An irregular or scalloped contour of the enhancing wall is very specific for abscess. Complications include airway compromise and abscess rupture leading to deep neck space infection and/or aspiration of pus. Ideally, peritonsillar cellulitis or phlegmon, treated with IV antibiotics, should produce an intermediate appearance between tonsillitis and frank abscess; yet the picture is often not so clear-cut. CT is excellent at distinguishing between tonsillitis and abscess, however approximately 25% of CT-suspected abscesses will in fact be phlegmonous and not drainable by I&D. Finally, in a setting other than acute infection, keep in mind the differential diagnosis of lymphoid hyperplasia, and inflammatory conditions such as angioedema and mucositis. In an older adult, squamous cell carcinoma must always be considered. Finnila TL, Sherman PM. 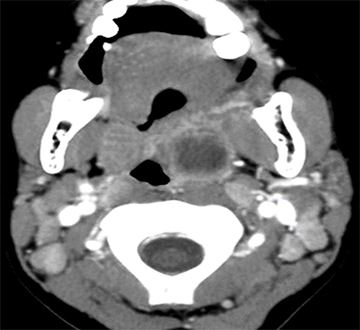 At the Viewbox: Tonsillitis Versus Tonsillar / Peritonsillar Abscess. J Am Osteopath Coll Radiol. 2014;3(4):33. Teresa L. Finnila, M.D., Paul M. Sherman, M.D.